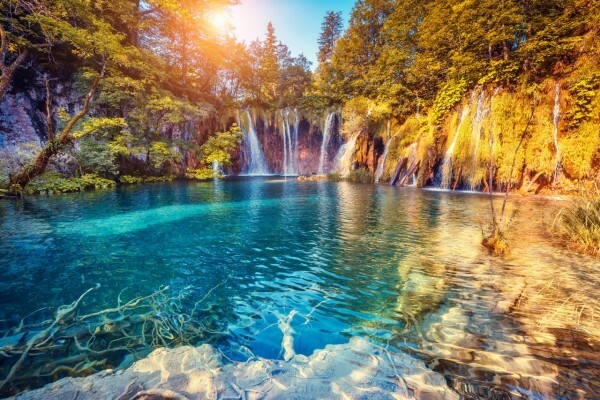 Easily Croatia's most popular National Park, Plitvice Lakes National Park is an absolute must when traveling Croatia. Join us on a spectacular day trip from Split where you can immerse yourself in the beauty of Plitvice Lakes and its famous 16 interconnected lakes and waterfalls. Walk the easy trails along the shores of the turquoise shimmering lakes, take the boat across Kozjak lake or perhaps the train ride through the forest and enjoy the stunning beauty of Plitvice. The advantage of this Split day trip is that you are in control of the day’s activities, being a private transfer, which means you determine when we start the tour and how much time you would like to spend in the park and return to Split. The day begins with us picking you up from your hotel or any other agreed location in our modern well-equipped minivan which has complimentary WIFI, so you can stay connected, and bottled water to keep you hydrated. After 1hour 30mins we will make a short stop before driving the remaining 1 hour 30mins to the entrance of the park. You are now the master of your own destiny in the park and can spend the next 4 hours of your time as you please walking one of the many trails. Be sure to visit the lower lakes, visit the big waterfall and of course glide along Kozjak lake in the boat. Once your time is up your driver will be waiting for you at the agreed pick up location and you will make your way back to Split. Round trip private transfer for up to 7 passengers with a super friendly driver to Plitvice Lakes National Park. The price is for the vehicle and not per person. This is a private tour so we can structure the day any way you would like and include a lunch stop after Plitvice Lakes.